Gorilla Grodd returns to Central City with an army of gorillas to take over the city. When he gains access to missile codes, Team Flash tries to stop him. Harry is still the best version of Harrison Wells, and his interactions with HR were even better in this episode. I also think it was great that he lied to Jesse about being sick in order to convince Jesse to return to Earth-2 with him. Like what dad does that? Harry, apparently. It was perfect. I also am glad Harry's around now to give Barry good advice and help him stay on track as a hero. While I do think Barry should have tried to kill Grodd, at the same time I understand that would mar his good name. While HR's part in the episode was small (as always), it was entertaining. His enthusiasm for "Friends Day" aka Valentine's Day was hilarious. Sometimes HR has his moments. At first, Gypsy annoyed me because she refused to help, claiming the "it's not my fight" cliché. But at the same time, I can understand why she wouldn't want to stick around after being controlled by an intelligent, telepathic gorilla. However, I love that she did finally give in and agree to help after Cisco chased her down on Earth-19. And it was awesome that she helped save the day by bringing Solovar to fight Grodd. I don't even care if it was a two-second cameo. Just the fact that there's a speedster on Earth-19 is freaking fantastic. I'm excited. I hope he comes back. (Maybe to help defeat Savitar?) He was the highlight of the episode. So Barry proposed to Iris, and I'm sitting here kind of apathetic about the whole thing. Like: yay? Good for them. I'm happy they're together. But like... who cares? They're together. It's not like it was that big of a struggle for them to get together. And I called it from the beginning of the very Valentine's-Day-themed episode that he was probably going to propose. Yippee. Most importantly: why was there no Julian? That's just so sad and wrong. I'm bitter. So bitter. Why? Grodd and his army of gorillas was just lame. The whole episode just... was lame. It seemed liked they spent their entire budget on the previous episode, leaving a few meager minutes near the end for epic gorilla action. Plus, most of Grodd's decisions in this episode didn't make a whole lot of sense. He was going to send a missile to destroy (Pick one: Central City? the world?) yet he wants to take over, so wouldn't the missile affect him also? Or is he suddenly invincible since he's an intelligent, telepathic gorilla. Also, how in the world did he even know that general guy had access to the missiles? Caitlin and Cisco could barely find that information online with their hacking, and only after they had a lead. How did Grodd just show up and know? Can he read everybody's mind? All at once? How does it work? Overall, I just... was disappointed in the plot of the episode. Nothing exciting happened. The logic of this episode also disappointed me. Solovar wasn't dead, even though there is no reason Grodd would keep him alive. The police/military can't help because they don't want Grodd to take over their minds like he took over Joe, yet what would stop him from taking over Jesse or Wally or even Barry's mind during the battle? Also, how in the world is ARGUS going to contain Gorilla Grodd? Do they even have a facility that can keep him locked up? 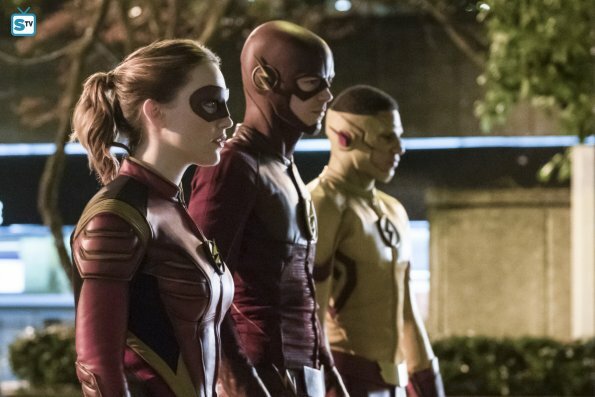 I'm convinced they didn't let Barry or even Solovar kill Grodd because then they can bring him back next season, which is just a poor excuse even if he is the only decent Flash foe left (because they killed off Snart). And they didn't even try to use Caitlin at all during this episode. Talk about disappointing. I expected this episode to follow in the footsteps (the giant gorilla footsteps) of "Attack on Gorilla City" in that it would be awesome and epic and have cool special effects and this intense battle sequence in Central City. Instead what I got was a mediocre episode with a chaotic CGI gorilla charge at the end, which was easily handled by bringing back the evil gorilla from the previous episode even though we all assumed Grodd probably killed him. (Like where exactly were you hiding?) Most of the episode was spent running around looking for solutions without actually seeing the gorillas in action. I don't know if they used up their budget in the previous episode or what, but "Attack on Central City" was just a disappointment. And come on, where did Julian go? The redeeming factor of this episode was definitely Cisco's awesome vibing and flirting with Gypsy and HR's "Friends Day" enthusiasm. What did you think of "Attack on Central City"?